Order handpainted Yorkshire Terrier Earrings from Unicorn Design, made of pewter with surgical steel earwire. 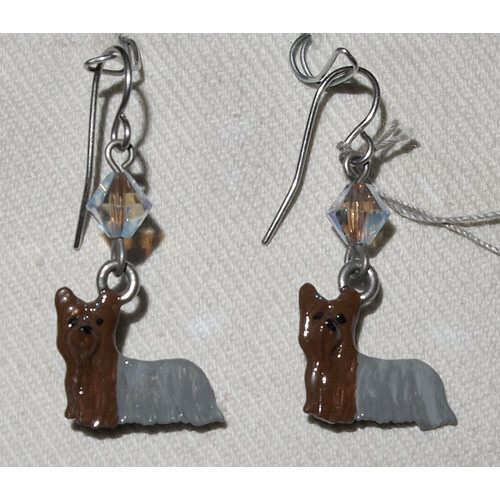 Earrings with handpainted silver oxidized pewter charms in the shape of Yorkshire Terrier 3-D standing dogs, painted brown with grey mantle. Above each charm is a Swarovski crystal bicone bead in the color Crystal AB. These earrings are for pierced ears and they have French hooks in surgical steel earwire. The length of the earring is approx. 25 mm and width 20 mm.